The "Syowa" Antarctic base (also called "Showa") is a scientific research station established by Japan in January of 1957. It is located in the coordinates 69°00'of South latitude and 39°35' of East longitude, on the Ongul island at the Lützow-Holm bay. Its name come from the era in the Japanese calendar during which it was established, the Showa period. With near 6,000 m2 of buildings, the research activities at the base include the physics of the high atmosphere, meteorology, seismology, gravimetrics, geodesy and cartography, oceanography, glaciology, geology, geography, terrestrial and marine biology and medical investigation. Also in 1970 started a series of scientific rocket launches essentially to investigate the Aurora and the Ionosphere. In that research context, the balloon program of the Japanese Space Agency ISAS (now JAXA) carried out launches of stratospheric balloons from Syowa base since the 60's decade. The first flight took place on October 28, 1968 utilizing a polyethylene balloon of 1000 m3 of volume, with a flight time of 18 hours. After that initial launch, similar experiences were carried out each year so during the first decade of balloon activities there a total of 33 launches were performed. As widely known, during the summer months in Antarctica occurs a phenomenon that consists of a stabilization of the direction of stratospheric winds in an anti-clockwise pattern around the pole with a descent of their velocity, allowing a full circle around the white continent in a week or so. This circular pattern is known as the "Antarctic Vortex". In 1984 the National Institute of Polar Research (NIPR) and ISAS balloon program, started a research project through which the Japanese scientific community sought to take advantage of that Vortex to perform long duration flights with stratospheric balloons around the pole. It was called "Polar Patrol Balloon" or PPB. The final objective was to achieve a complete Antarctic circuit and after that try to land the payload as close as possible from the launch point. During the first 5 years, the program was focused in the development of vital technical elements to reach its goal. For example, in function of the limited telemetry and command capacities in so long distances, was necessary to create an automated ballast system, as well to implement a communication link with the balloons in flight using an ARGUS transmitter and NOAA's satellites. Though the first two launches from Syowa base in December of 1987 did not achieved a full circle, they confirmed the feasibility of the project specially taking account that the real path followed by the balloons was close to the routes projected by the models. These flights also obtained an important wealth of weather data wich will play a key role in the future of the project. The first PPB flight which completed a full circle around the pole was initiated in Christmas of 1990 using a balloon of 25,000 m3 of volume transporting a Proton Magnetometer. After 14 days at float altitude it passed again very near of the base Syowa. It ended his flight on January 28, 1991, after turning back in his route due to the natural weakening of the Vortex. Since then, more than 10 successful missions of PPB transporting diverse scientific instruments were done. 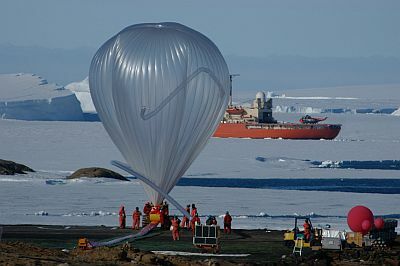 Based on the excellent scientific results obtained from the ballooning in Antarctica, in 1998 a new program was started on part of the Physics of the High Atmosphere and of Physics and Chemistry of the Polar Atmosphere, both divisions of the NIPR, to perform new experiments utilizing greater balloons and being able to succesfully recover the payloads at the end of each flight. This presented several challenges, because aside the natural difficulties of any scientific activity in the continent, should be considered the logistic limitations, the lack of trained personnel, an area for recovery limited by the rescue helicopter range (55 kms), and all this to be made on very short notice. Some of the modifications introduced to reach these objectives were the redesign of the balloon inflation system to make it in a shorter time, the implementation of a new monitoring system based on a GPS transmitter onboard the balloons and a telemetry reception antenna capable of being operated by remote control with a two axis automatic mechanism of orientation controlled by a computer. Additionally, was introduced a special telemetry link to send and receive data and commands from the central station of the NIPR in Japan to the Syowa station using the INMARSAT system. This permits the monitoring in real time of the data obtained in each mission by the scientists located in Japan. The first experience that made use of the improved infrastructure took place in 1998, with the launch and successful recovery of a cryogenic atmospheric sampling instrument developed by the University Tohoku. 1/3/1998 2 h CRYOGENIC SAMPLER In theLutzow-Holm bay, 42 kms from the launch site. 1/13/2003 12:16 18 d ELECTRIC FIELD MEASUREMENTS In the sea 300 km off the Chilean coast. 1/13/2003 6:48 25 d ELECTRIC FIELD MEASUREMENTS In the sea 500 km off the Chilean coast. 1/4/2004 15:57 ~ 13 d BETS (Balloon borne Electron Telescope with Scintillating fibers) Payload lost over Antartic Ocean.